Hello December!! Yes! I have been waiting a long time for you. Well, kind of. More so, I have been semi-patiently waiting to make gingerbread and peppermint everything. I am a stickler for waiting until December 1st before I put up anything Christmas-y, make anything gingerbread themed, and drink any eggnog. I feel that each holiday deserves it's own month before moving on. Obviously the stores thing otherwise because eggnog has been in stock since Halloween. To me that takes all the excitement away when things are available long before the actual holiday. But, that is just my opinion. But, now that it's finally December, I can share all my christmas-y treats that I am pretty excited about. Yes, there will definitely be more desserts this month than healthy food. But, I feel like it comes with the season. To kick off the month, I thought I'd share these cookies with you. 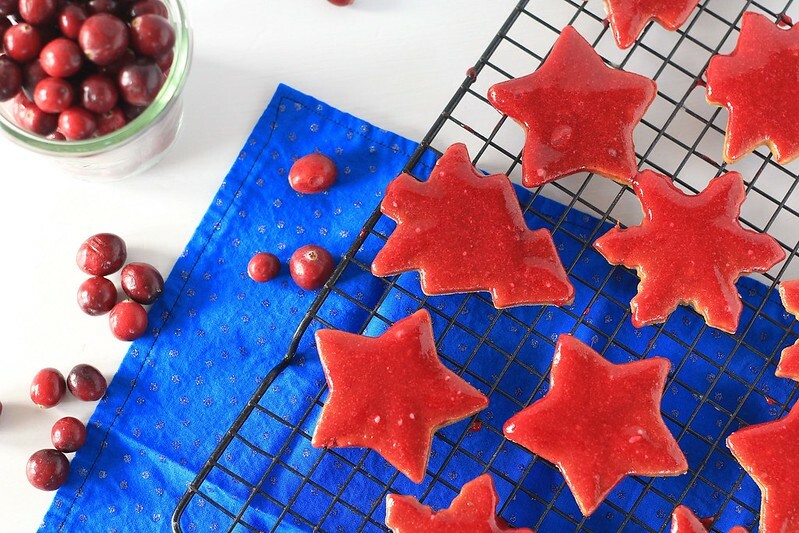 They are the perfect blend of spices and cranberry. 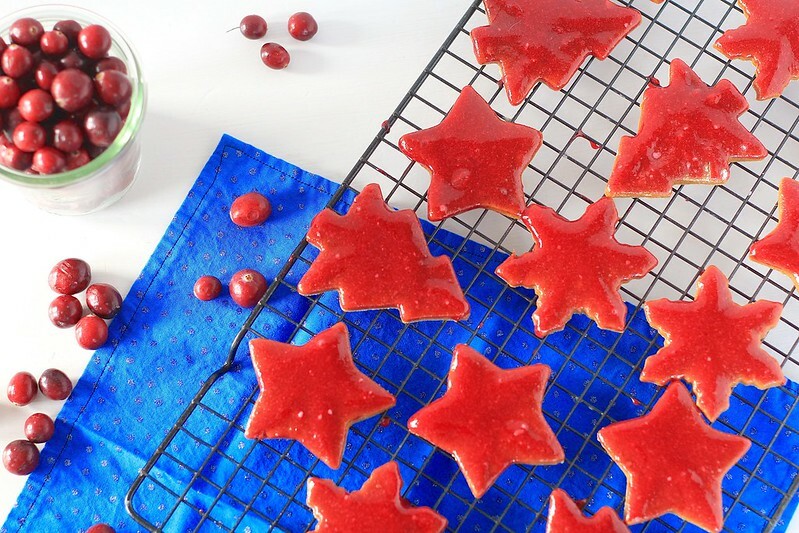 Using cranberry "jelly" as a glaze is brilliant. And the combination of the flavors is exactly on point. This makes a fun activity to do with kids too. My kids love love to cut out cookies with the over abundance of cookie cutters I seem to have collected over the years. And dipping the cookies into the glaze is always fun for all ages alike. Especially when you "accidentally" get frosting on your fingers. 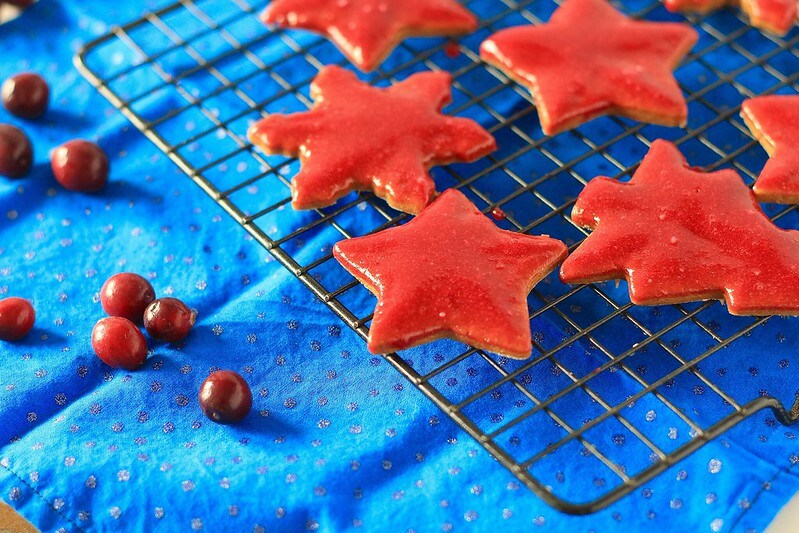 Start your holiday season off right by making these cookies this weekend! In the bowl of an electric mixer fitted with the paddle attachment, beat together the butter and brown sugar on medium high speed, until light and fluffy, about 3-4 minutes. Mix in the grated ginger and orange zest until combined. Mix in the egg and molasses just until combined. In a medium mixing bowl, whisk together the flour, salt, allspice, ground cloves, nutmeg and cinnamon. Add the dry ingredients into the butter mixture on low speed, just until completely combined. Gather the dough into a ball and press down, cover in plastic wrap and chill for about an hour. When the dough has chilled, preheat the oven to 350ºF. Have ready two baking sheets lined with parchment paper or a silicone baking mat. Roll the dough out on a well floured surface until about 1/4-inch thick. 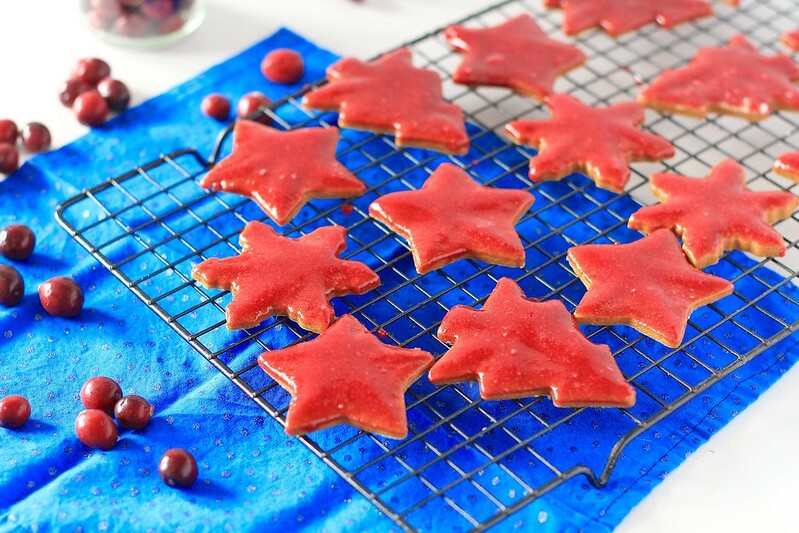 Cut using desired cookie cutters and place the cutout cookies onto the prepared baking sheet. 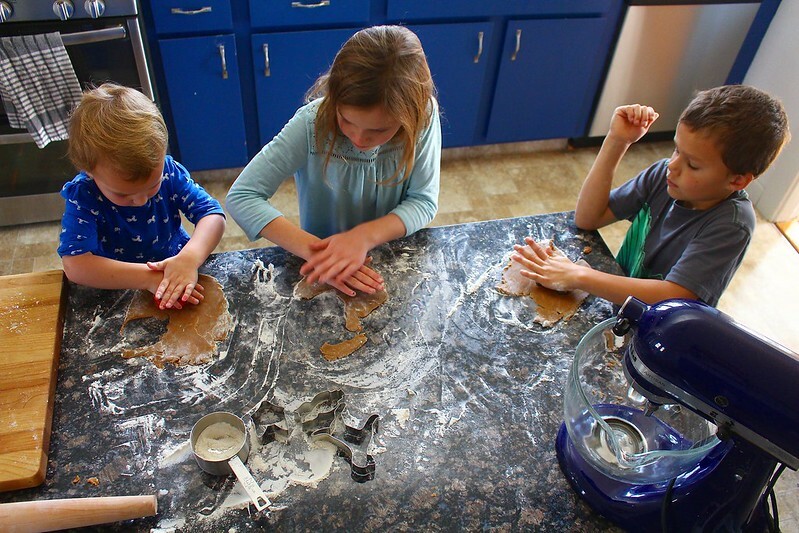 Gather the remaining dough together and re-roll and cut until the dough is gone. Place the cookies in the preheated oven and bake for about 10-12 minutes, or until the edges are just barely beginning to brown. Don't over-bake or you'll have crunchy cookies. Let cool for 10 minutes before removing the cookies to a cooling rack. Let cool completely before glazing. 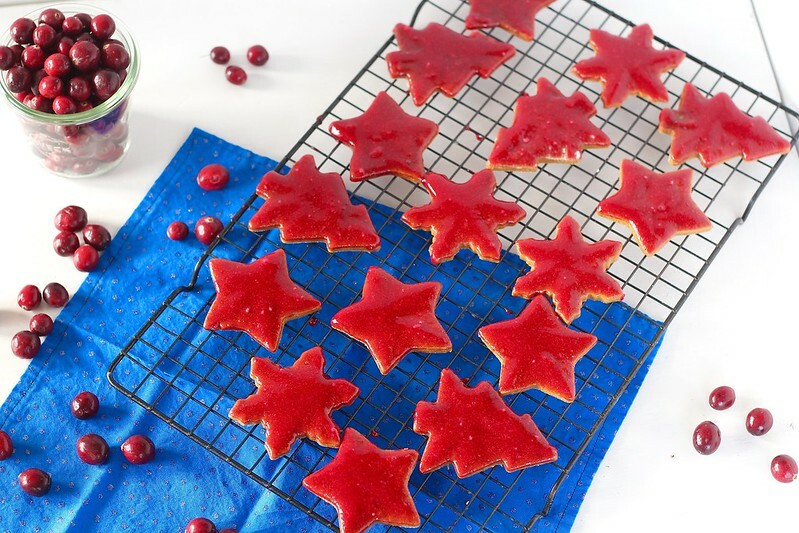 To make the cranberry glaze, place the cranberries, 2 tablespoons water and 1/4 cup confectioners' sugar in a medium saucepan. Cook over medium heat until the berries burst and soften, stirring occasionally, about 5-10 minutes. Pour the cranberry mixture into a blender and purée until completely smooth. Place a fine mesh sieve over a bowl and push the cranberry mixture through the sieve. Push it through with a rubber spatula until all the juice is in the bowl. Discard the leftover solids. Whisk the remaining 1 cup confectioners' sugar until the cranberry sauce until smooth. Taste and add more sugar if needed. Once the cookies are cool, dip or spread the glaze over the cookies. Place back on the cooling rack until the glaze hardens. Store in a covered container in the refrigerator up to one week.